The undefeated Cleveland Browns faced a major test in the inaugural All-America Football Conference season as they hosted the Los Angeles Dons on October 20, 1946. The Browns were off to a sensational start under innovative Head Coach Paul Brown and had a 6-0 record. Brown had assembled a team that included many players that he was familiar with from coaching in the college and service ranks, such as QB Otto Graham, ends Dante Lavelli and Mac Speedie, FB Marion Motley (pictured at right), G Bill Willis, and OT/PK Lou Groza, and they were all excelling. The Dons were at 3-1-1 under Head Coach Dudley DeGroot. Viewed as the more glamorous team coming into the AAFC season, LA had several established pro veterans. They also had QB Angelo Bertelli, the Heisman Trophy winner out of Notre Dame, although Charlie O’Rourke had done the better job thus far behind center. There were 71,134 fans in attendance, which was the largest crowd in pro football history at the time. The Browns threatened first as they reached Los Angeles territory thanks to a pass from Otto Graham to Dante Lavelli that gained 46 yards, but they came up empty when a fake field goal attempt failed. The Dons then drove 67 yards, resulting in QB Charlie O’Rourke throwing to end Bob Nowaskey for an 18-yard touchdown. Joe Aguirre added the extra point to make it 7-0. Los Angeles was able to keep the Browns in check on offense for the remainder of the first half, but was also unable to add more points. In the second quarter, Cleveland stopped another advance by the Dons when Graham, showing his skill on defense, intercepted an O’Rourke pass at his 31 and returned it to the LA 45. HB Don Greenwood ran for two yards and two passes were incomplete but the Browns scored on a 48-yard Lou Groza field goal. The score remained 7-3 at halftime. In the third quarter Cleveland’s offense came to life and put together an 85-yard drive. Key plays were runs by HB Edgar “Special Delivery” Jones for 15 yards and FB Gaylon Smith for 16 before a pass from Graham to Lavelli gained 36 yards and set up Graham’s two-yard carry for a TD. Groza added the point after and the Browns were in front by 10-7. As the fourth quarter started, Joe Aguirre of the Dons attempted a 34-yard field goal that was blocked by tackle Chet Adams. Three plays later, Graham connected with Mac Speedie for a 47-yard touchdown, Groza again converted, and the home team’s lead was up to 17-7. LA responded with a 50-yard series but, after reaching the Cleveland 26, had to turn the ball over on downs. Two running plays, the longest for 17 yards by Greenwood, got the ball past midfield and then, with the Dons looking for a pass, Marion Motley broke away for a 48-yard TD. Groza added the extra point to make it 24-7. The Dons again drove into Cleveland territory, going 62 yards. Following an O’Rourke throw to Nowaskey to make it first-and-goal on the six, O’Rourke kept the ball himself on the next play, running around end for a touchdown. Aguirre’s PAT made it a ten-point game, but it didn’t take long for the Browns to respond. On their first play from scrimmage after the ensuing kickoff, Motley struck again, running 68 yards for a touchdown. Groza converted, thus sealing the 31-14 Cleveland win. The Dons had the edge in total yards (395 to 353) and first downs (21 to 10), outrushing Cleveland by 274 yards to 224, but the Browns made the bigger plays in the second half that overcame LA’s statistical edge. Each team turned the ball over three times. With the two long touchdowns, Marion Motley rushed for 143 yards on just eight carries. Otto Graham completed four of 10 passes for 129 yards with a touchdown and an interception. For the Dons, Charlie O’Rourke and Angelo Bertelli combined for 10 pass completions out of 20 attempts for 121 yards and a touchdown along with an interception. The Browns finally lost the next week to another Western Division rival, the San Francisco 49ers. They were defeated again in the rematch with the Dons but didn’t lose another game on the way to a 12-2 record and a title game victory over the New York Yankees. Los Angeles placed third in the Western Division at 7-5-2. Otto Graham went on to lead the AAFC in touchdown passes (17) and yards per attempt (10.5) and placed second in passing yards (1834) and completion percentage (54.6). He received first-team All-AAFC honors. 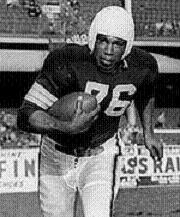 Marion Motley rushed for 601 yards on just 73 carries for an 8.2 average and five touchdowns.